Film noir is an organic American cinematic movement, but its DNA contains elements from elsewhere: the visual motifs of German Expressionism, the fatalistic viewpoint of artists fleeing the war in Europe. It’s only fitting, then, that the twelfth annual Noir City Film Festival cast its net wide and showcased noir from around the globe. Programmer, master of ceremonies and impresario extraordinaire Eddie Muller has assembled an amazing line-up including several films that have never screened theatrically in the United States before. Rosemarie and I attended the opening weekend in San Francisco. The festivities kicked off with international intrigue in a duo of films dominated by Orson Welles even though he didn’t direct either one. 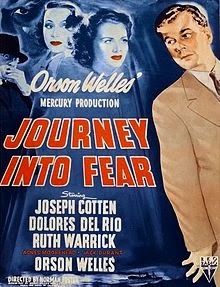 Journey Into Fear (1943) would mark the end of Welles’ sojourn at RKO. Norman Foster is credited as the director but Welles’ fingerprints are everywhere, starting with the cast of familiar faces. Joseph Cotten is the munitions engineer passing through Turkey at the start of World War II. Cotten puts his patrician bearing to excellent use playing one of those WASPish Americans overly concerned with propriety, which becomes an impediment when he’s targeted by Nazi agents and must flee the country by boat. A truncated 68 minute running time owing to a troubled production nonetheless preserves the leisurely, almost comedy of manners feel of the Eric Ambler novel. Minor but engaging. Welles plays a Turkish cop. His hat earned a round of applause from a packed Castro Theatre. Saturday afternoon brought forth a pair of unsung films from Mexico. 1951’s En la palma de tu mano (In the Palm of Your Hand) features one of my favorite noir tropes: the bogus psychic. “Professor” Karin relies on his beautician wife to acquire information about the upper crust which he then deploys to his advantage. When he deduces an industrialist was murdered by his spouse, he horns in on the scheme – only to become enmeshed in the newly rich widow’s plot to eliminate her lover. Featuring glossy, high-toned storytelling that wouldn’t be out of place in a studio film of the era shot through with a brooding Catholic sensibility that is distinctly Mexican. Up next, a screening of the only subtitled print of the astonishing Victimas del pecado (Victims of Sin, 1951) in the U.S. Starring “The Golden Venus” Ninón Sevilla, it’s an example of the rumberas or nightclub film and compresses an entire telenovela into ninety unhinged minutes with time to spare for some of the sexiest dancing ever before a movie camera (Exhibit A and Exhibit B). A piñata that never empties, Victims communicated directly with the audience’s reptile brain. We didn’t care about motivation or coherence. We only wanted, craved, demanded MORE. These two movies, produced when the Production Code still held sway over Hollywood, demonstrated the freedom filmmakers elsewhere had when addressing adult subject matter. A scene in Palm has a married couple in the standard separate beds of the 1950s only to have the husband slip in beside his wife, while Victims is breathtakingly forthright about prostitution. Me ruining a perfectly good book. A personal milestone came on Saturday evening. 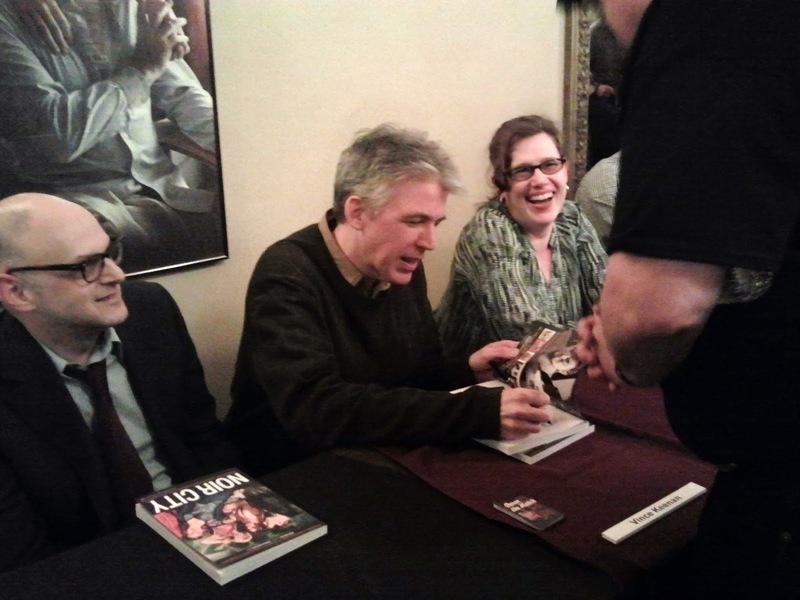 The sixth Noir City Annual, collecting work published in the 2013 editions of the Film Noir Foundation’s magazine, debuted, and a host of contributors including yours truly were invited to a gala signing. It was a pleasure to be seated alongside ace designer Michael Kronenberg – the man responsible for the gorgeous cover of Down The Hatch – and talented writers like Steve Kronenberg, Imogen Sara Smith, Dan Akira Nishimura, Anne Hockens and Carl Steward among others. The annual will be sold at other Noir City festivals and soon through Amazon; please note that my signature on a copy of the book actually makes it worth less. 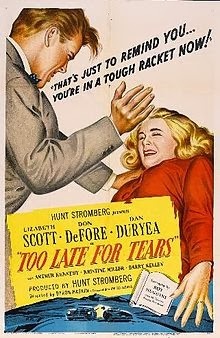 For the last few years Eddie has been keeping festgoers apprised of the status of the FNF’s latest project, a restoration of the independently made 1949 film noir Too Late For Tears. The new 35mm print, financed in part by a contribution from the Hollywood Foreign Press Association’s trust, was unveiled on Friday night. Having seen it, I should just toss the two public domain DVDs I own. Roy Huggins’ casually diabolical script prefigures A Simple Plan as young L.A. marrieds Lizabeth Scott and Arthur Kennedy accidentally come into possession of a hefty extortion payoff. As Scott’s avaricious tendencies get the better of her, the blackmailer (Dan Duryea) comes calling. It’s unquestionably Liz Scott’s finest hour, but good luck taking your eyes off Duryea who saunters onto the screen all rancid insouciance and ends up timid and broken before La Scott. How successful was Saturday’s screening? People were turned away from a theater that seats over 1400 people. Our gaze shifted to the Far East on Sunday with a twin bill from Japanese master Akira Kurosawa. The Drunken Angel of the 1948 film’s title is Takashi Shimura’s doctor, toiling amongst the poor of occupied Japan. He patches a bullet wound for brash yakuza Toshirô Mifune and insinuates himself into the younger man’s life, a relationship that becomes more critical once Mifune’s callous boss is spring from prison. 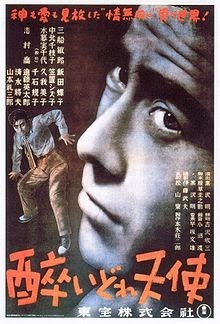 A masterwork of humanism made more impressive when followed by Stray Dog (1949), with the same actors reteamed as Tokyo cops pursuing a stolen police gun through a sweltering summer. Maestro Muller, never missing an opportunity, arranged for culturally appropriate libations to be poured throughout the festival. On this night we enjoyed sake served up by Beau Timken, owner of San Francisco’s True Sake and author of Sake: A Modern Guide. A second round came courtesy of the woman Eddie dubbed “the ichiban of noir,” our very good friend Etsuko Tamazawa. The impossibly stylish Etsuko has a film noir blog in Japanese, and beautifully provided Eddie’s introductions in her native tongue. Alas, that was it for us, but Noir City Seattle starts in only two weeks. Not every title that screened in San Francisco will play in the Northwest; the Mexican films we saw won’t make the trip, for instance, and neither will The Black Vampire, a 1953 Argentine remake of Fritz Lang’s M unspooling at the Castro on Friday. Miss Noir City 2014 Evie Lovelle. Also pictured: me. There are so many people to thank for our experience at the festival, which continues through Sunday. First and foremost is Muller. The other big piece of news out of Noir City is that Eddie will be joining Turner Classic Movies as a regular on-air host. Eddie’s knowledge and above all his passion for film makes him the perfect addition to America’s repertory theater. This year’s Miss Noir City is burlesque performer and long-time friend of the festival Evie Lovelle, who performed her duties with aplomb and her usual drop-dead flair. 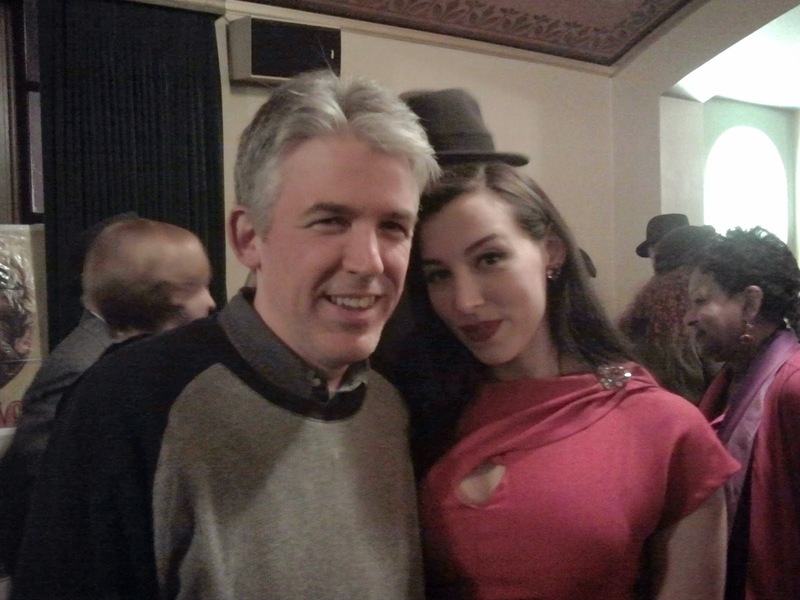 There’s also the utterly essential Daryl Sparks and the army of volunteers who make Noir City a one of a kind event. Cocktail notes ... on this trip I finally made it to the highly touted Rickhouse, where I enjoyed a Fort Point (bourbon, grapefruit, tart cherry, falernum) and a Rye Smile with rye, lemon and mint. I’d heard nothing but raves for the drinks at Nopa so I ventured there for brunch with David Corbett. I can thus sing the praises of the California perfect Sunshine Fix (aperol, gin, lemon and Angostura bitters). If you’re dining around the corner from the Castro at Poesia – and you should – order yourself a La Dolce Vita made with Jack Daniel’s and Amaretto. My primary contribution to this year’s Noir City will come on Friday night when, naturally, I won’t be there. Cocktails at the Castro that evening will be made with Giffard liqueurs and by Erik Hakkinen, the Giffard rep in the U.S. whose secret identity is bartender at my haunt the Zig Zag Café. Should you find yourself at the theater, be sure to sample his handiwork – then tell him to get back up here and make me a drink.